When Should I Give My Pet Flea And Tick Prevention? It’s a question we hear all the time here at Market Street Animal Clinic: “When should I give my pet flea and tick prevention?” The easiest and most simple answer is year round. Now, we understand some like to give their pets (and wallets!) a break from the preventatives. However, it is always easier (and less expensive) to prevent fleas and ticks then treat them or any diseases they may bring. We all know fleas can make dogs and cats itchy, but did you know they can also give your pets tapeworms and cause anemia? Treating these issues can be extremely expensive and cause your pet unwanted stress and discomfort. Fleas thrive in warm clients, but that doesn’t mean your pet can’t get fleas in the winter! 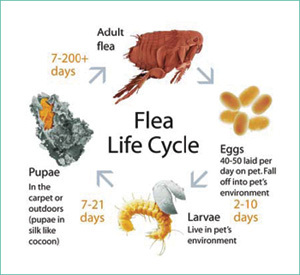 Female fleas lay up to 50 eggs per day and those eggs can take up to a year to become adult fleas, which will start the whole process over again. With topical flea prevention, the medication is distributed through your pets oil glands. Once an adult flea lands on your pet, the flea dies. Most flea preventatives have an insect growth regulator that kills flea eggs and larvae, which prevents the entire flea life cycle. Here in Loudoun County, we see a lot of ticks on both pets and humans. Ticks can carry Lyme disease and other deadly diseases as well. This summer, we treated three dogs with Rocky Mountain Spotted Fever! Did you know that a tick’s favorite time of year is the fall? That’s when they are most active! And don’t think they die off during the winter either! Deer ticks, in particular, remain active during the winter months and actually begin feeding after the first frost. Concerned about applying chemicals to your pets? The ingredient pyrethrins is common in tick repellents and is actually a natural chemical extracted from chrysanthemum flowers. It can be expensive to keep your pet on year round prevention for fleas and ticks, but it is certainly less expensive than potential vet bills from tick borne disease or ridding your house of fleas! If you have a hard time remembering to apply your flea and tick preventatives to your pet, try setting an alert on your phone, applying it the same day you pay your rent/mortgage, or the first day of the month. To figure out which preventative is just right for your pet, stop in and speak with one of our veterinarian technicians or veterinarians! I live on the 4th floor and the only outdoor exposure my cat has is when he is on my balcony. Does he need flea protection? Thanks for reading our blog, Chris! We would recommend that your cat be on some sort of flea prevention. While your cat is at a lower risk than cats that spend a lot of time outdoors, fleas are resourceful and could still get to your cat. You could potentially bring fleas inside with you if you visit a friend’s dog that has a flea problem or if a family member brought their cat over. If you are local to Leesburg, VA, give our clinic a call and we would be glad to answer any other questions you may have! Our hospital’s phone number is 703-777-6661.